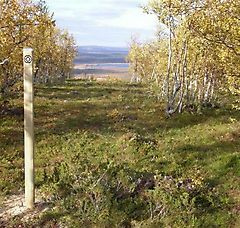 The Swedish work for the nomination of the Struve Geodetic Arc on the UNESCO World Heritage List has mainly been done by Lantmäteriet (the Swedish Mapping, Cadastral and Land Registration Authority). Riksantikvarieämbetet (the Swedish National Heritage Board) is the Swedish agency that on a national level is responsible for heritages issues. The active management and preservation of the Swedish Struve Geodetic Arc World Heritage points are done by the Swedish management council consisting of Lantmäteriet, the four municipalities where the points are situated (Haparanda municipality, Övertorneå municipality, Pajala municipality and Kiruna municipality), the County Administrative Board of Norrbotten and the Museum of Tornio Valley. The work is guided by a Management Plan valid for the years 2018–2023, with listed requirements and actions for securing the availability of land and the accessibility, maintenance and promotion of the sites. Current work includes communication efforts with involvement of tourist organisations, schools, private persons and the rural development organisation Tornedalen 2020 currently running a transnational Struve Geodetic Arc project. Contact person at Lantmäteriet is Dan Norin (e-mail: dan(dot)norin(at)lm(dot)se). 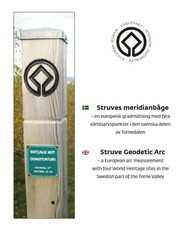 Of the seven Swedish sites in Struve Geodetic Arc, four are preserved as a World Heritage points. 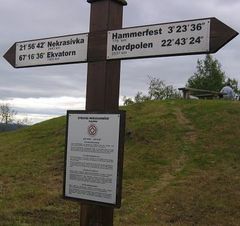 These four points are from south to north Perävaara, Pullinki, Jupukka and Tynnyrilaki. Proper information signs and smaller signs of metal have been placed close to or on the points. Efforts have also been done to make all points more accessible through road signs, parking lots, marked walking routes and small cottages for wind and weather protection. Two Swedish stamps in commemoration of Struve Geodetic Arc were issued 6 May 2011. A sculpture in honour of Wilhelm Struve and the Struve Geodetic Arc was erected in Haparanda in 2012, located close to the Finnish World Heritage point Alatornion Church. 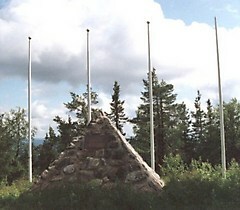 A monument over the triangulation chain measured under the leadership of the Frenchman Pierre Louis Moreau de Maupertuis in 1736-37 is also placed at the point Pullinki. The mission of this expedition was to measure the length of a degree of the meridian in order to determine if the earth was oblate or prolate at all. Perävaara is situated approximately 25 km northwest of Haparanda in the vicinity of Karungi on a forested hill. 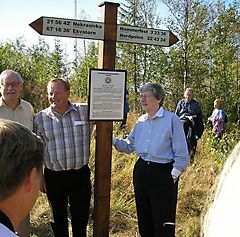 From a small road, there is a 400-metre marked walk to the point, which is marked by a cross. Pullinki is a mountain close to Svanstein with a small ski resort, where the point is located close to the summit. Jupukka is since 1977 a nature reserve situated northwest of Pajala and north of the bridge over the Torne River along riksväg 99. A 500-metre marked steep walk to the top. 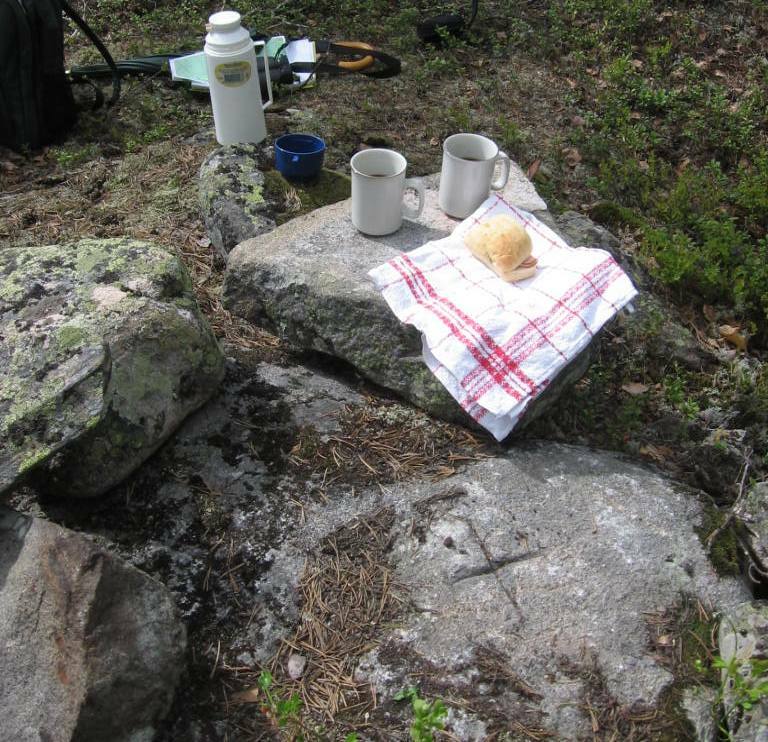 Tynnyrilaki is situated approximately 30 km southeast of Karesuando and east of riksväg 99. 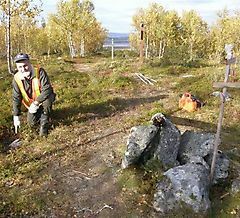 After 7 km on gravel roads, there is a parking lot at the northern foot of the mountain, from where it is a 1-kilometre marked walk. The name originates from the Swedish word “tunna”, which means “barrel”, since barrels were used as optical signals during the measurements. by a cross in a stone. Photo: Hans-Fredrik Wennström. Small information sign at Jupukka. president of the Royal Academy of Sciences. 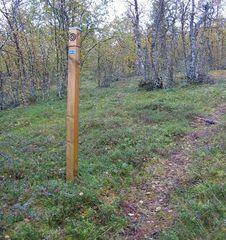 Marked walking route to Tynnyrilaki. Photo: Dan Norin. 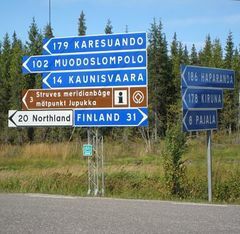 Road sign indicating the way to Jupukka. 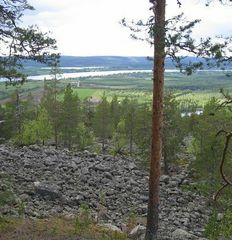 point Pullinki over the Torne River.